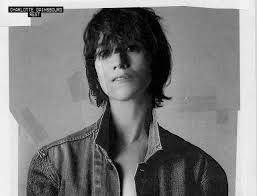 Charlotte Gainsbourg is a regular guest in my book. Just like her step sister Lou Doillon, who is less known in this country, which is a shame. Charlotte most likely profits from the fact that her father's family name is far more known than Lou's. Both ladies share the same mother, Jane Birkin, who scored a huge hit with Serge Gainsbourg in 1969 and 1974, being one of the most scandalous hits ever at that. With Rest Charlotte Gainsbourg returns to the pop front with her first studio album in 6 years. It is an album full of grace and distinction. Somehow it seems to be above the bickering of the world and all that comes with it. An album placed out of time. In the lyrics Gainsbourg switches between her father and mother tongue just if it is normal to do so. With her thin voice she hovers above the music as if a balloon only barely contained from floating away. At 46 she sings like a French "zuchtmeisje" of the 60s. Innocent yet so innocuously seductive. On Rest Gainsbourg worked mostly with producer SebastiAn, but you'll also find Daft Punk's Guy-Manuel de Homem-Christo, Brian Burton (a.k.a. Danger Mouse) and Paul McCartney contributions. Gainsbourg shared more duties than before on lyric writings. Musically the album is closer to '5:55' than 'IRM', the album she made with Beck. Soft disco and Giorgio Moroder-light pulsing beats can be found on Rest. Without ever becoming truly dance music, the influences of the music can be found everywhere on Rest. The pulses are the backbone. Over it electronic layers are placed and (synthetic) strings, giving the album a mysterious and floating quality. I can imagine myself floating on this music. Softly caressed while surrendering myself totally. Just listen to 'I'm A Lie'. The way the music drifts through my head is mesmerising. All the little electronic pulses weave a magic carpet. Rest opens with a killer track. Oh so subtle and oh so modest, the song wriggles itself into my mind probably to never let go, only to leave this world with me. 'Ring-a-Ring O' Roses. It has the quality and sound of 'The Persuaders Theme', John Barry's timeless contribution to television theme's. Add to that sophistication the modern, slow beats and Charlotte Gainsbourg's whispering voice and fast cars, beautiful girls and jet set around the globe are all within an imaginary grasp of everyone who is listening. This quality is continued with the songs that follow. 'Lying With You' is a beautiful song. 'Kate' is the more direct song on Rest. The big surprise of this album is that the title track is co-written and produced by de Homem-Christo and sounds in nothing like Daft Punk. All the features that make the duo's music so recognisable and often pleasant to listen to are totally absent here. 'Rest' is an empty song, all atmosphere and no musical melody. Another surprise is Paul McCartney who contributed a song to Rest. 'Songbird In A Cage' is the kind of disco as could be found around the 'McCartney II' album. Elementary disco like 'Goodnight Tonight'. Slowly the song is flashed out and starts to convince. The typical McCartney elements, those little extra melodies, are hidden away in the mix but can be found by those who listen. When deep into the album a fine song like 'Dans Vos airs' passes, I start to understand that I'm not just listening to any album. Rest is a well-made record, with several fine and a few great songs, where only the title song does not really find its way to me. The melody of 'Dans Vos Airs' is warm and embracing. Again I'm carried away easily. The album ends with a dance tune called 'Les Oxalis' and finally some fun with a child singing the alphabet song, set to some great music, grandeur is a better word. A nice ending to an experience called Rest. With 'Lay Low' Lou Doillon delivered a fine album (read on here: http://wonomagazine.blogspot.nl/2015/12/lay-low-lou-doillon.html). That made it to my favourite albums of 2015 and to my favourites of this decade. I truly wonder where Rest will stand later on in this decade.